This is an extremely important report. I have included Philpott’s take on it and the article from the Rodale institute. The take home is that unequivocally, industrial synthetic farming is clearly inferior to industrial organic farming and rather importantly will continue to diverge because of the persistent decline in carbon content in the synthetic soils. This removes any further need to hedge ones choices. An organic protocol will out perform its competitor consistently. Read the articles carefully. There is a lot of specific data that needs to be understood. I personally go a lot further and also call for application of biochar soil dressing as an ongoing soil building protocol to sharply reduce the need if not eliminate the need for adding any form of fertilizer at all. Most noteworthy, we discover that the organic soils are slowly increasing their carbon content, so even without the biochar, the soils improve. That's what a lot of powerful people -- including the editors of The Economist -- insist. But the truth could well be the opposite: It might be chemical-intensive agriculture that's the frivolous luxury, and organic that offers us the right technologies in a resource-constrained, ever-warmer near future. 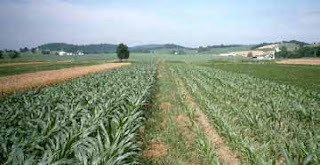 Corn in the organic-legume (left) and conventional (right) system during the dry summer of 1995. Both were planted on the same day, with the same variety but only the conventional corn is showing signs of water stress. Organic corn yields that year were 29 percent higher than those of the conventional corn.Photo and caption: Rodale InstituteBut it gets more interesting. As the globe warms up, increased droughts are likely to reduce global crop yields. The ag-biotech industry is scrambling to come out with "drought-resistant" GMO crops. But organic ag might already have that covered: "In 4 out of 5 years of moderate drought, the organic systems had significantly higher corn yields (31 percent higher) than the conventional system." Herbicides were only detected in water samples collected from the conventional system. In years when the conventional rotation had corn following corn, during which atrazine was applied two years in a row, atrazine levels in the leachate sometimes exceeded 3 ppb, the maximum contaminant level set by EPA for drinking water. Atrazine concentrations in all conventional samples exceeded 0.1 ppb, a concentration that has been shown to produce deformities in frogs. Water volumes percolating through each system were 15-20% higher in the organic systems than the conventional system, indicating increased groundwater recharge and reduced runoff under organic management. Inevitably in the comments section below, someone will ask about the manure. How much land does it take to support sufficient cows to produce enough manure to replenish organic fields? But the Rodale results show that nitrogen-fixing legume crops can greatly reduce the contribution needed from livestock. And anyway, let me turn that question around. Where do industrial agriculturalists intend on getting the synthetic nitrogen for their system -- from what energy source? The main feedstock is natural gas; but the easy natural gas has been tapped in the United States. That leaves us reliant on geopolitically unstable foreign suppliers -- or on domestic shale gas, which relies on the water-fouling process of hydrofracturing. And where do they plan on getting phosphorous? In the end, organic ag looks like the robust and wise approach to responding to population growth and climate change, and chemical ag looks like the gambler's approach -- a luxury for the well-heeled folks who own shares in the agribiz industry. Founded in 1981, the Farming Systems Trial (FST) is America’s longest running, side-by-side comparison of conventional and organic agriculture. The project shows the feasibility of making a transition to organic production and the multiple economic, environmental and energy conservation impacts. FST has shown the potential of organic agriculture to improve our soil and water, while at the same time produce crop yields and net returns that are comparable (or better) than conventional systems. This system represents an organic dairy or beef operation. It features a long rotation including both annual feed grain crops and perennial forage crops. The system’s fertility is provided by leguminous crops and periodic applications of manure. This diverse rotation also creates a primary line of defense against pests. This system represents an organic cash grain system. It features a mid-length rotation consisting of annual grain crops and cover crops. The system’s sole source of fertility is leguminous crops and the rotation provides the primary line of defense against pests. This system represents the majority of grain farms in the U.S. It relies on synthetic nitrogen for fertility, and weeds are controlled by synthetic herbicides selected by and applied at rates recommended by Penn State Extension. Corn yields over 27 years of the trial were equivalent between the organic and conventional systems. Soybean yields were the same for the manure and conventional system and only slightly lower for the legume system. In 4 out of 5 years of moderate drought, the organic systems had significantly higher corn yields (31% higher) than the conventional system. Corn and soybean crops in the organic systems tolerated much higher levels of weed competition than their conventional counterparts, while producing equivalent yields. yields that year were 29% higher than those of the conventional corn. Soil carbon and nitrogen have increased significantly in the organic systems, but not in the conventional system. Based on preliminary 2009-2010 soil sampling data, the organic systems have shown the largest increases in soil carbon since the beginning of the trial. In terms of carbon sequestration the manure system is leading, followed by the legume system. Increases in soil carbon were greatest in the first 13 years of the trial. Soil carbon continued to build in both organic systems during the 15 years following 1994, but at a slower rate than the first 15 years. The conventional system has shown a loss in carbon in more recent years. Overall, nitrate-nitrogen leaching was fairly low and the same for all systems. Water leachate samples from the conventional system more frequently exceeded the legal limit of 10 ppm for nitrate-nitrogen concentration in drinking water compared to the organic systems. Herbicides were only detected in water samples collected from the conventional system. In years when the conventional rotation had corn following corn, during which atrazine was applied two years in a row, atrazine levels in the leachate sometimes exceeded 3 ppb, the maximum contaminant level set by EPA for drinking water. Atrazine concentrations in all conventional samples exceeded 0.1 ppb, a concentration that has been shown to produce deformities in frogs (Hayes et al., 2002). Total energy use in the organic systems was less than in the conventional system. Energy use in the conventional corn-soybean system was dominated by the production of nitrogen fertilizer and herbicide inputs, while seed and fuel use generated the greatest energy demands in organic systems. Several economic studies of the early years of the Trial (1980’s and 1990’s) showed that net returns for the two grain operations, the legume and conventional system, were the same (assuming that all farm products received the same price at market). Even with the inclusion of the transition costs (such as potential loss of yields in start-up years) and family labor costs, the organic price premium required to equalize the organic and conventional returns was only 10% above the conventional product. Throughout the 1990s, the organic price premium for grains exceeded that level, and premiums ranged between 65% and 140%. Agronomic, environmental, energy and economic analyses of the systems are all currently being updated to include the new rotations and tillage regimes as well as current information regarding inputs and prices.